Account of His Own Times. Tanna of the fourth generation; lived, probably at Lydda, in the second half of the second century; son-in-law of Simeon ben Yoḥai and a fellow disciple of Judah I. He was more celebrated for piety than for learning, although his discussions with his father-in-law (Shab. 33b) evince great sagacity and a profound knowledge of tradition. A haggadah gives the following illustration of Phinehas' scrupulous honesty: Once two men deposited with him two seahs of wheat. After a prolonged absence of the depositors Phinehas sowed the wheat and preserved the harvest. This he did for seven consecutive years, and when at last the men came to claim their deposit he returned them all the accumulated grain (Deut. R. iii.). Phinehas is said never to have accepted an invitation to a meal and, after he had attained his majority, to have refused to eat at the table of his father. The reason given by him for this course of conduct was that there are two kinds of people: (1) those who are willing to be hospitable, but can not afford to be so, and (2) those who have the means but are not willing to extend hospitality to others (Ḥul. 7b). Judah I. once invited him to a meal, and exceptionally he decided to accept the invitation; but on arriving at the house of the patriarch he noticed in the yard mules of a certain kind the use of which was forbidden by local custom on account of the danger in handling them. Thereupon he retraced his steps and did not return (Ḥul. l.c.). Special weight was laid by Phinehas upon the prescriptions relating to the tithe. This feature of Phinehas' piety is described hyperbolically in the Haggadah. The latter relates a story of a mule belonging to Phinehas which, having been stolen, was released after a couple of days on account of its refusal to eat food from which the tithe had not been taken (Gen. R. xlvi. ; comp. Ab. R. N. viii., end). To Phinehas is attributed the abandonment by Judah I. of his project to abolish the year of release (Yer. Demai i. 3; Ta'an. iii. 1). Phinehas draws a gloomy picture of his time. "Since the destruction of the Temple," he says, "the members and freemen are put to shame, those who conform to the Law are held in contempt, the violent and the informer have the upper hand, and no one cares for the people or asks pity for them. We have no hope but in God" (Soṭah 49a). Elsewhere he says: "Why is it that in our time the prayers of the Jews are not heard? Because they do not know the holy name of God" (Pesiḳ. R. xxii., end; Midr. Tch. to Ps. xci. 15). Phinehas, however, believes in man's perfectibility, and enumerates the virtues which render man worthy to receive the Holy Spirit. The Law, he says, leads to carefulness; carefulness, to diligence; diligence, to cleanliness; cleanliness, to retirement; retirement, to purity; purity, to piety; piety, tohumility; humility, to fear of sin; fear of sin, to holiness; holiness, to the reception of the Holy Spirit; and the Holy Spirit, to resurrection ('Ab. Zarah 20b; with some slight variants, Soṭah ix. 15). The Haggadah records many miracles performed by Phinehas. Among these is that of having passed on dry ground through the River Ginai, which he had to cross on his way to ransom prisoners (Yer. Demai i. 3). According to another version, Phinehas performed this miracle while he was going to the school to deliver a lecture. His pupils, who had followed him, asked if they might without danger cross the river by the same way, whereupon Phinehas answered: "Only those who have never offended any one may do so" (Ḥul. 7a). 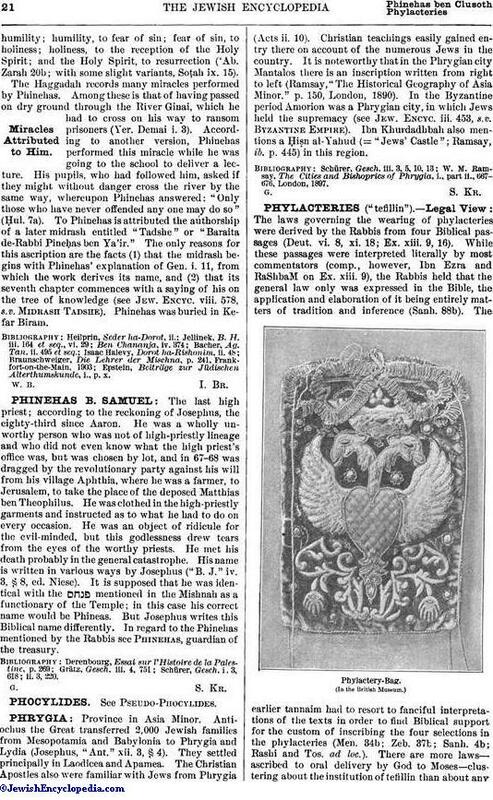 To Phinehas is attributed the authorship of a later midrash entitled "Tadshe" or "Baraita de-Rabbi Pineḥas ben Ya'ir." The only reasons for this ascription are the facts (1) that the midrash begins with Phinehas' explanation of Gen. i. 11, from which the work derives its name, and (2) that its seventh chapter commences with a saying of his on the tree of knowledge (see Jew. Encyc. viii. 578, s.v. Midrash Tadshe). 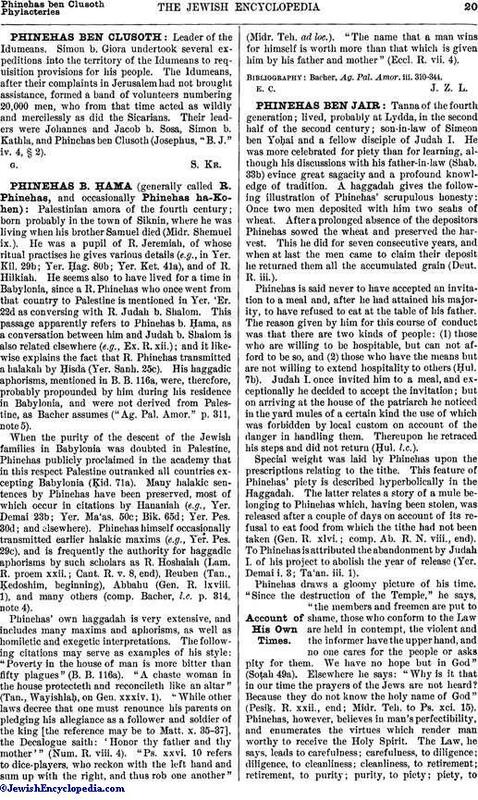 Phinehas was buried in Kefar Biram. Epstein, Beiträge zur Jüdischen Alterthumskunde, i., p. x.